Popular crowdfunding platform Kickstarter has raised over $1Bn for artistic projects, including over five thousand projects tied to publishing. But most Kickstarter publishing category campaigns fail to raise even a fifth of their targets. Since Kickstarter fundraising is all or nothing, this means only a third of book projects launched actually go on to publication. Data nerds like me may want to visit kickstarter.com/help/stats for the full post-mortem. Suffice to say: raising money to publish your book is really hard. A book project that was successfully crowdfunded by the author. But it’s not impossible. I have produced successful Kickstarter campaigns for writers, ranging from a gritty New Jersey mob memoir with a ten-pin twistto an adorable children’s picture book introducing entrepreneurship. Their successes were not a coincidence. Despite their very different audiences, their paths to success were similar. Tap into your extrovert and PROMOTE. This is conjecture, but perhaps the reason book campaigns fail disproportionately is because writers tend to be introverts. We want that loophole whereby our work will be found without us having to tell anyone about it. Nope. The Kickstarter campaign is excellent sales boot camp. For both Bowling For The Mob and Camila’s Lemonade Stand, we had a month of promotion prior to the campaign before launch. The goal was to make sure everyone relevant heard about the campaign at least 10 times during the 30 days before launch, through the 30 days up to close. Map out the money in advance. The occasional Kickstarter campaign goes viral, even books. However, all 136,000 campaigns in the history of Kickstarter have not. In all likelihood, yours will not. So you need to know both exactly how much money you need to produce your book, and exactly where that money is going to come from. 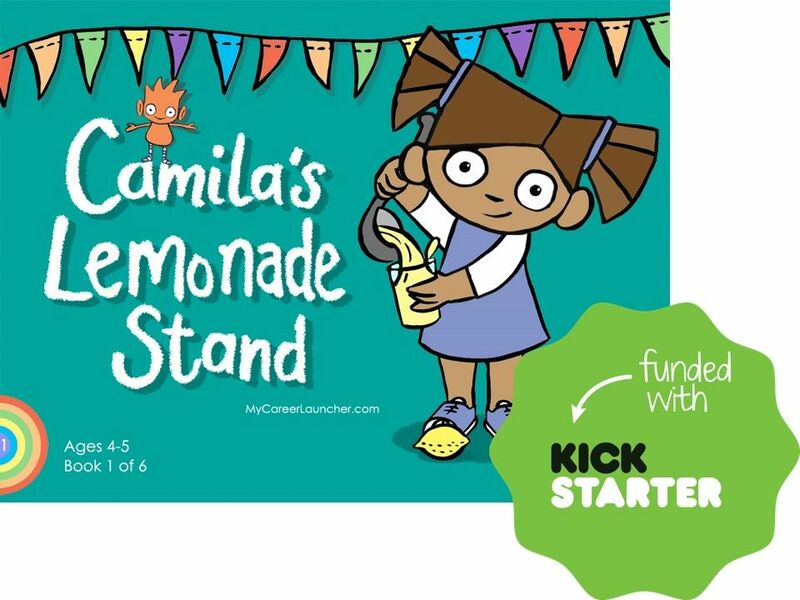 After learning the nail-biting hard way on Bowling For The Mob, for Camila’s Lemonade Stand we went through a detailed Kickstarter Estimator process before the campaign launch. This was like a wedding guest list, but with the added columns of how much money the invitees were likely to pledge, and for what kind of reward. Then we applied the 65% rule – because not everyone we invited to the campaign was going to show up (they didn’t). So let’s say we need to raise $6,500 to produce a book. We sit down and tally up all of our friends, colleagues, family, and fans, and what they’re likely to pledge. That comes to $10,000. We multiply by 65%, get $6,500, and voila, this is a campaign that has a chance to succeed. If, on the other hand, we need $20,000 to produce the book, and then we tally up our likely pledges and that comes to $5,000, well… we don’t even need to bother with the 65% rule. This campaign is almost certainly going to fail. Shoot a decent, short video. Kickstarter makes a big deal about having a video – any video. People want to see and hear from you. Good light and good sound go a long ways towards making a homemade video watchable. For Bowling For The Mob we had Bob sit directly under a skylight and used a microphone and an iPhone propped on a soda cup; for the Camila’s Lemonade Stand video we used a bright floor lamp with the shade removed behind the camera and a Samsung Galaxy phone with a tripod and microphone. Neither of these videos will win any awards, but they are watchable, informative, and they are SHORT. Don’t underestimate how brief attention spans are. Keep it under 3 minutes. These three tips are the tip of the iceberg. Please feel free to contact me at bethanyjoycarlson@hotmail.com at The Artist’s Partner to discuss your project and how Kickstarter might work for you. If you’re considering Kickstarter to fund your book, it’s hard – but possible. No hocus pocus required. Bethany Joy Carlson is a co-founder of BACCA Literary, a WriterHouse board member, and founder of The Artist’s Partner. Do you provide a service for publishers? Would you like to write a guest article for Book Publishers Northwest? Contact us at bpnwnews@aol.com.